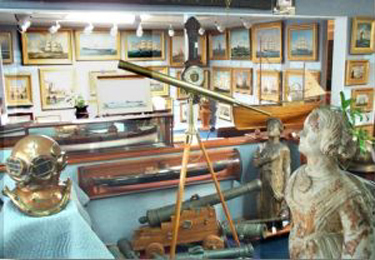 Vallejo Gallery offers the finest quality maritime and marine themed art and marine antiques from the past three centuries. Established in 1972, the gallery is dedicated to the celebration of the sea in art. Featuring the most extensive collection of its kind, the art gallery is complemented by our full range of marine artifacts. The Gallery features paintings of artistic excellence and historic significance - stirring sea battles, coastal scenes, famous expeditions, pleasant afternoons along the seashore, topographical views of ports. Our pieces come from artists the world over and from old masters to new masters. The gallery’s paintings, ship models, instruments and artifacts each represent an authentic piece of maritime history; physical evidence from the timeline of humankind’s maritime endeavor. We seek to offer the finest examples in terms of both beauty and importance. Our goal has always been to inspire an appreciation of the sea and it's surroundings, not only for the obvious aesthetic pleasure and investment, but also as a means to understanding the importance of preserving our maritime heritage. We are always seeking to purchase the finest quality maritime and marine themed art.